New experiences for a new year . . .
Well, the New Year is here and I’m feeling another year older. It’s common in many countries to make a resolution for the New Year, usually something like losing weight or giving up smoking; however, this year, I’ve decided to become a little more adventurous. There are a plethora of weird and wonderful sights to see around this world of ours, and I’ve decided that 2011 is the year for me to see a few more of them. I’ve chosen 3 events that appeal to me, and if possible I want to visit the following events this year. The first is the Hindu festival of Holi that takes place on March 19 across India. Originally Holi was a spring fertility and harvest festival, but now it is a colourful celebration of life, with people smearing each other with brightly-coloured paint, and throwing coloured water and dye over everything and everyone. I’ve always been a fan of Indian food, so I might be able to kill two birds with one stone. Next on my list is the wonderfully English Gloucestershire Cheese Rolling Festival held around May 30 each year. You might need to be a bit crazy, but the idea of running (or rolling) down a steep 180m hill chasing a piece of cheese sounds too good to pass up. The event has been held for over 200 years, but maybe not for much longer due to concerns about injuries, so this might be my last chance. 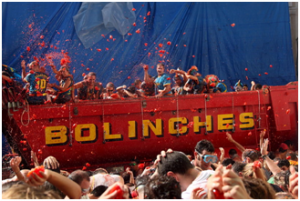 In August, I figure the La Tomatina tomato fight in Buñol near Valencia, Spain, might be the place to be. The main event of the festival is a tomato fight in which up to 30,000 people use 100,000 kg of fresh tomatoes as weapons to throw at and over each other. The fight only lasts an hour, which is probably a lot less time than the cleaning up afterwards. So that is my resolution for 2011, and I really plan to visit these places. However, like most resolutions, I’ll probably just give up on my plans after a few days and stay home as usual. Why don’t you let me know what you resolve to do this year, maybe we can encourage each other to stick to our resolutions!